It's always ridiculously fun to see our favorite celebrities do silly things on social media, and Dwayne "The Rock" Johnson does not disappoint. The wrestler-turned-actor might be fierce and business savvy on HBO's Ballers, but when he's off-duty, he's quite the fan of the musical performance. 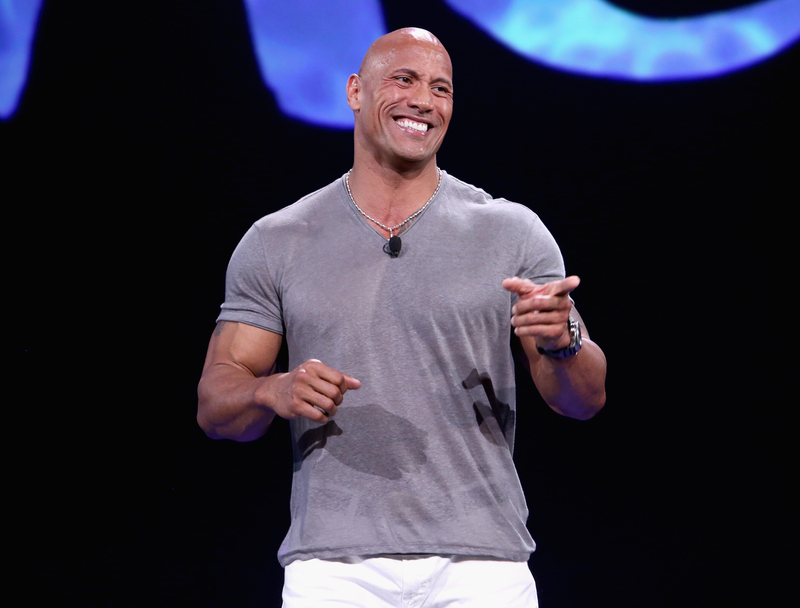 On Saturday, a video he posted on his Instagram showed "The Rock" dancing around in workout gear at his gym, and it proved that while he might be a giant muscle man, he's also weird and funny and loves the performing life. This is far from the first time Johnson has danced and sang (or at least, fake sang) his way into our hearts. He's shown off his singing and dancing talents on numerous talk shows, movies, and even during his hosting stint on Saturday Night Live. Dancer Derek Hough recently stated to EW that he would love to have Dwayne Johnson join the new season of Dancing With The Stars, and Hough actually has a great idea on his hands. Johnson is quite the talented dancer and just a great performer in general; it would be a blast to see him competing in a dance series, if only to witness how competitive and ambitious he'd get on the dance floor week to week. Check the many ways Dwayne Johnson has proven he's just as talented on the dance floor and onstage as he is in the wrestling ring or on the set of a film. Seriously, these videos will make your day. On the first episode of Spike TV's Lip Sync Battle, Dwayne Johnson took on Jimmy Fallon, and Johnson easily dominated the Tonight Show host from the first round with this lip syncing rendition of Taylor Swift's "Shake It Off." As Fallon says after Johnson's performance, you can tell he's done this before in his bedroom. I have no idea why this happened, but when Johnson started singing carols on Live With Kelly & Michael, I instantly began wishing it was holiday season already. This video of Johnson doing a Samoan dance in the film Be Cool proves why he would be an incredible dance competitor and champion on Dancing With The Stars. Props to Derek Hough — I'm really into this idea. I can't believe this sketch was cut for time on Saturday Night Live! Because Ellen could make anyone dance (or really, do anything), this video of Johnson trying to get Ellen to guess what dance he's trying to do is quite simply perfection.